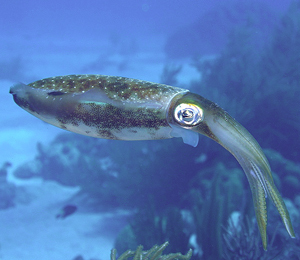 The only squid species you will typically find while snorkeling in Key West is the Caribbean Reef Squid. Sometimes these squid are confused with cuttlefish due to the wrapping of their fins around their body, but cuttlefish are not usually found on the Florida coast. Reef squid are usually no more than 20 inches long, and travel in small schools close to the reefs. They have striking eyes. In fact, they have the largest eye-to-body ratio of any animal on land or sea! Reef squid are quite interesting to watch. They can rapidly change the texture and color of their skin, not only for camouflage, but also to communicate. Especially at dawn and dusk, the common mating hours, squid can be seen displaying a range of colors and patterns at amazing speeds. It is even possible for a squid to display one pattern to a male squid on his left while displaying another pattern to a female on his right. They are quite fascinating! In addition to changing the pigment of their skins, squid also use their body shape to communicate. They may point their bodies vertically when striking prey or curl up during hostile situations. They love to eat, and use their two long tentacles to catch small fish, crustaceans, and other mollusks. Reef squid are typically not bothered by snorkelers. Some are shy, but others may be curious as to your presence, and quite bold when it comes to getting to know you.